After having hit 40 cities around the world, from the Cote D'Azur to Katmandu, from Manchester to Mombassa in the past decade with his infamous street mosaics, the artist Invader, is bringing his unique vision to Lazarides' Rathbone Gallery in London. 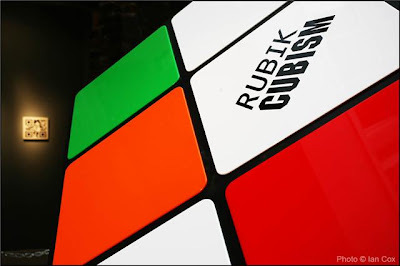 Low Fidelity will feature all new works from the series ‘Rubikcubism’. 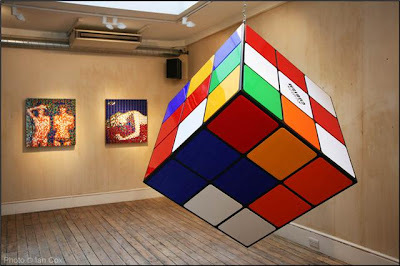 Using the famous 80’s puzzle game’s cubes as pixels, the artist has recreated album covers by rock bands such as the Velvet Underground, The Cure, Roxy Music, David Bowie and Michael Jackson. 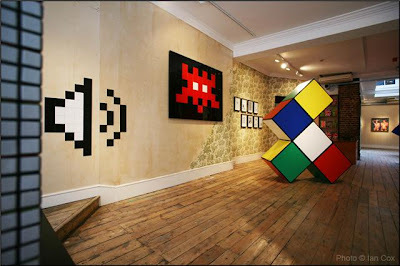 In addition to these classic images as well as a selection of sculptures and original works on paper, Invader has taken the pixelated image one-step further crafting his very own ‘barcodes’. These abstract works are only discernable with the aid of a mobile phone digital camera, the image from which is then ‘decoded’ into a text message. The exhibition at Lazarides Rathbone will run from the 14th August through the 17th September. Thanks to Ian Cox for the great pictures, go check out more of his pictures over on his flickr here.